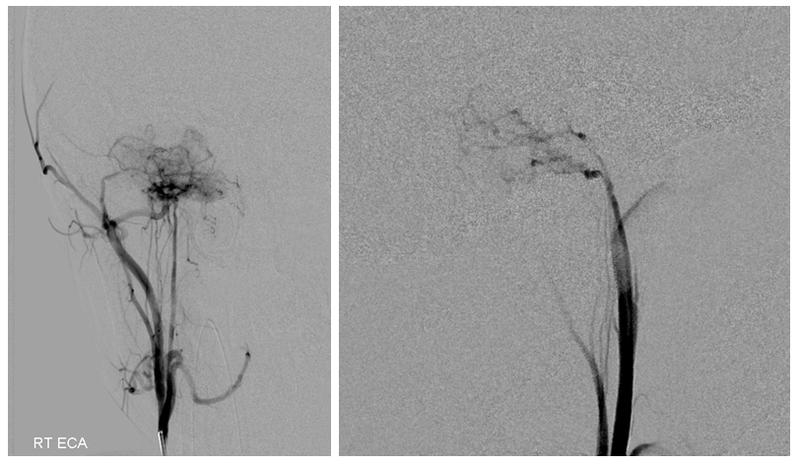 The value of catheter angiography in radiologic diagnosis can be appreciated with the requisite knowledge of the angiographic features displayed by various lesions. 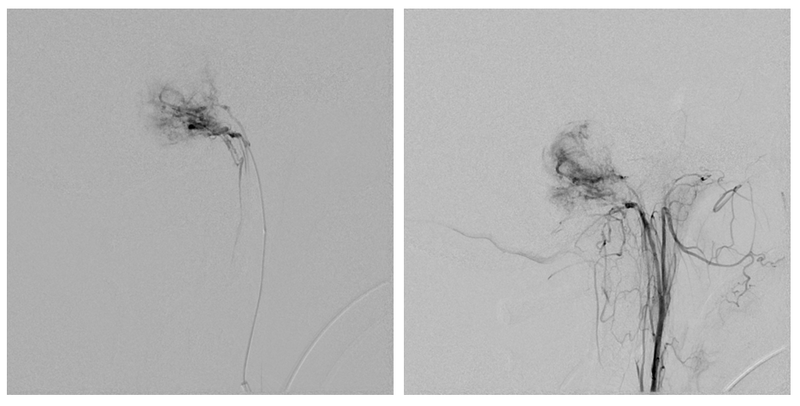 In this role angiography can be highly complementary to modern non-invasive techniques. 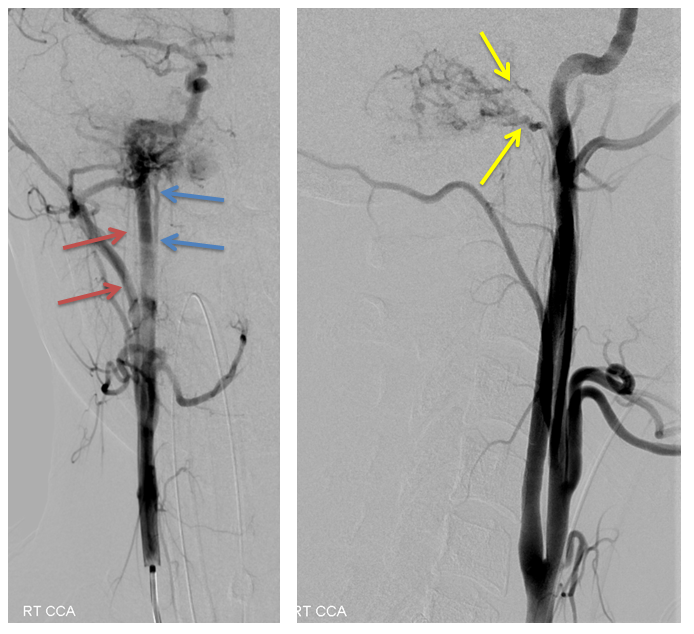 The following case presentation, discussion, and imaging was prepared by Dr. Eytan Raz. Attending of record Dr. Howard A. Riina. 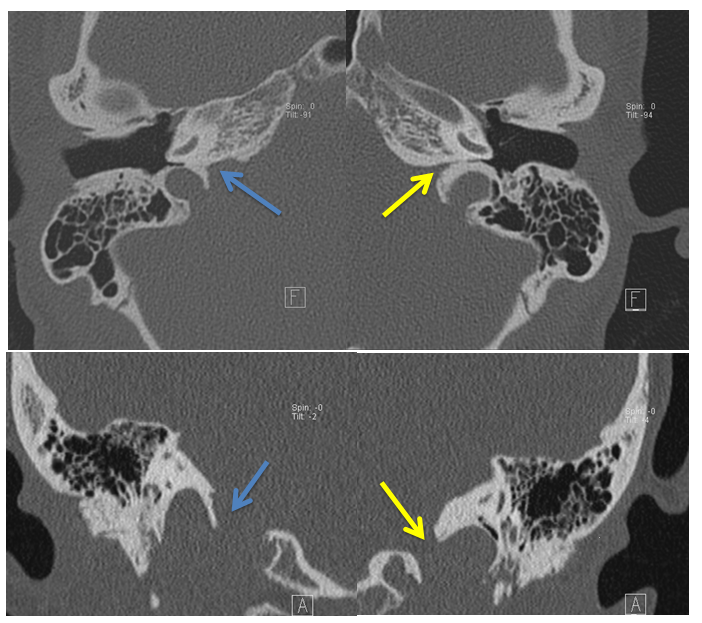 The MRI demonstrates that the extra-axial mass is centered in the pars nervosa of the jugular foramen. The differential diagnosis encompasses the basic gamut of extra-axial lesions most commonly involving this region, i.e. schwannoma, meningioma, glomus tumor (glomus jugulare), metastasis, lymphoma, hemangiopericytoma. The mass has no obvious dural base. High vascularity is perceived on high resolution T2 images. The jugular foramen is enlarged but smooth. No bone destruction is noted on CT. 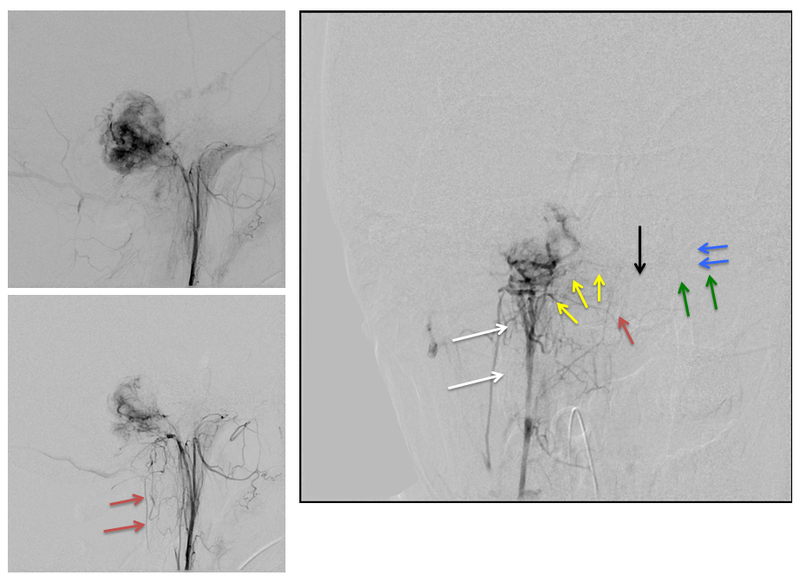 Complete surgical excision is planned but in order to better establish vascularity and feasibility of presurgical embolization, an angiogram is performed. Schwannoma: Unlikely. 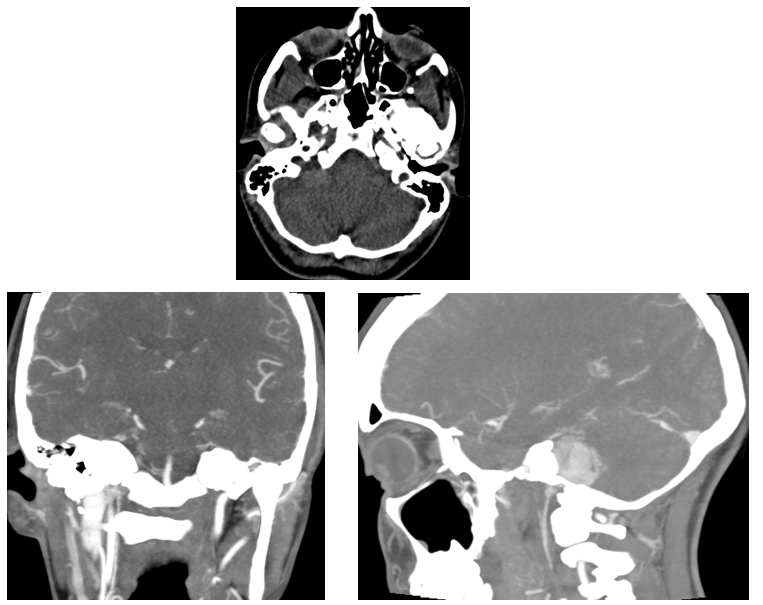 The location and the general appearance of the lesion (smooth enlargement of the foramen) are favorable for this diagnosis, but the high vascularity noted on the T2 would be highly atypical. Meningioma: Unlikely. Lack of a dural base would be atypical. The lesion is centered in the jugular foramen while usually the meningiomas in this location use the jugular foramen as a route to extend from the intra- to extracranial compartments. 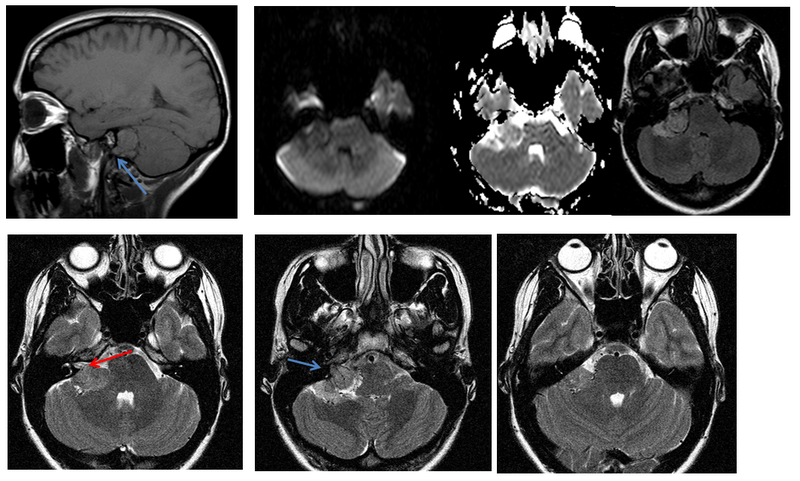 Glomus tumor: Unlikely. The lack of sigmoid sinus invasion, the lack of bone destruction and the absence of salt and pepper appearance speak against this diagnosis. Lymphoma: Unlikely given the benign smooth enlargement of the foramen and isointensity on DWI. Met: Unlikely given the benign smooth enlargement of the foramen. No primary tumor known. Hemangiopericytoma: Nothing against this diagnosis, except, maybe, the uncommon posterior fossa location. 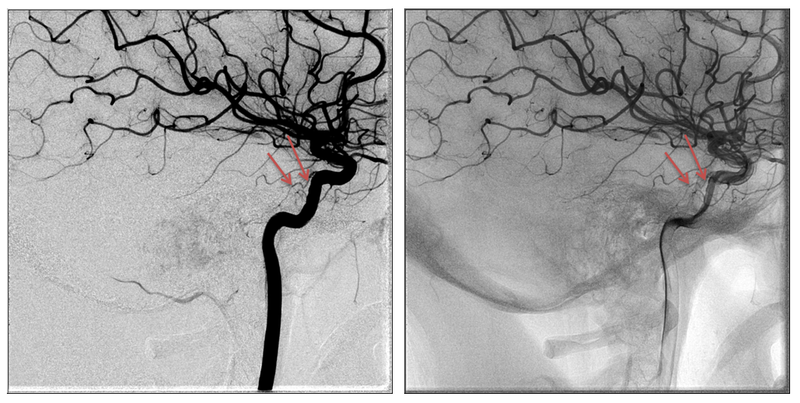 The angiogram demonstrates the lesion to be fed by the jugular trunk of the right ascending pharyngeal artery and by the stylomastoid branch of the occipital artery. While an intense staining blush is noted, no early shunt is visualized. 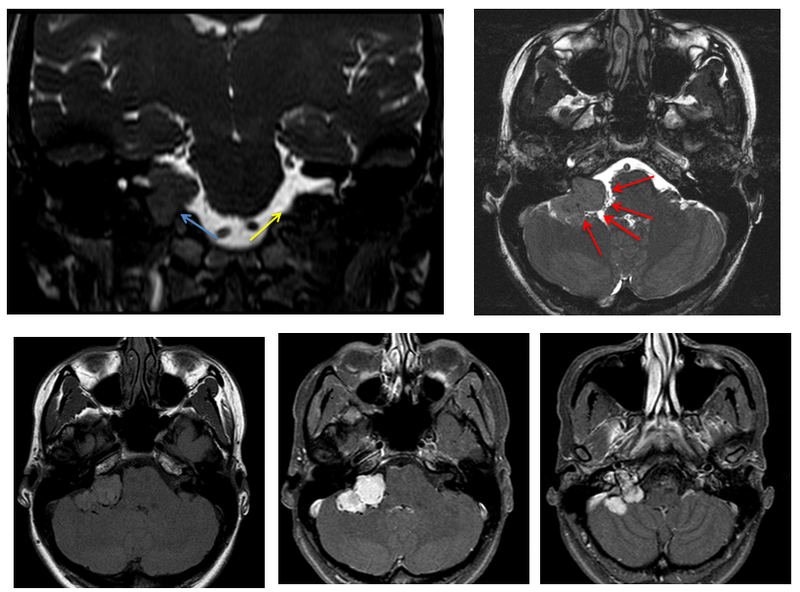 The absence of early shunt and the confirmation of preserved sigmoid sinus are findings that speak against the diagnosis of glomus tumor. The persistence of staining is similar to the one visualized in meningiomas, but the irregularity of this tumor vasculature has not the typical “sunburst” radial pattern consistent with meningioma. Altogether the findings suggest that the diagnosis of hemangiopericytoma is the most likely.